Welcome to January, home of the post-holiday blues, my super cold feet (seriously I need five pairs of socks right now) and deliciously healthy eating! Everyone I know is getting a start on their New Years’ resolutions, namely eating healthier. I’m all for starting the year fresh and with food that not only makes us feel great, but tastes amazing too! Who says healthy food has to be boring? Not me! 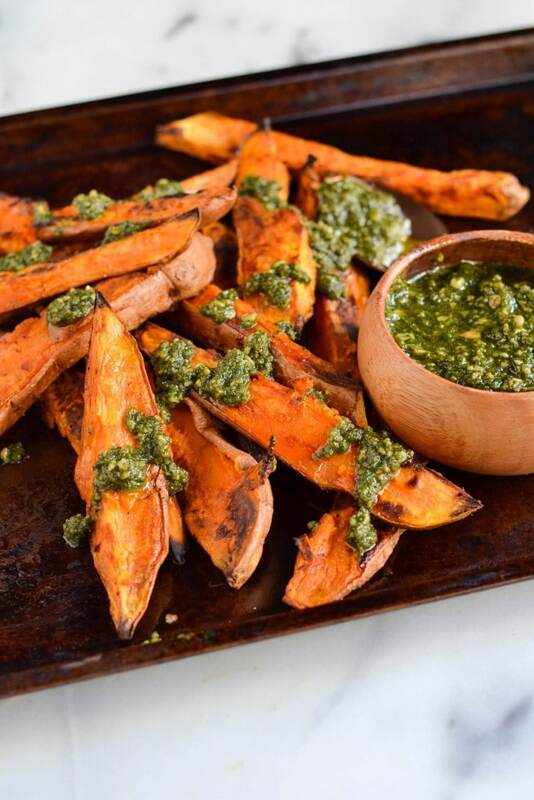 That’s where these baked sweet potato wedges with vegan parsley pesto fit in. They’re baked instead of fried making them a great option for when you’re feeling a little indulgent. 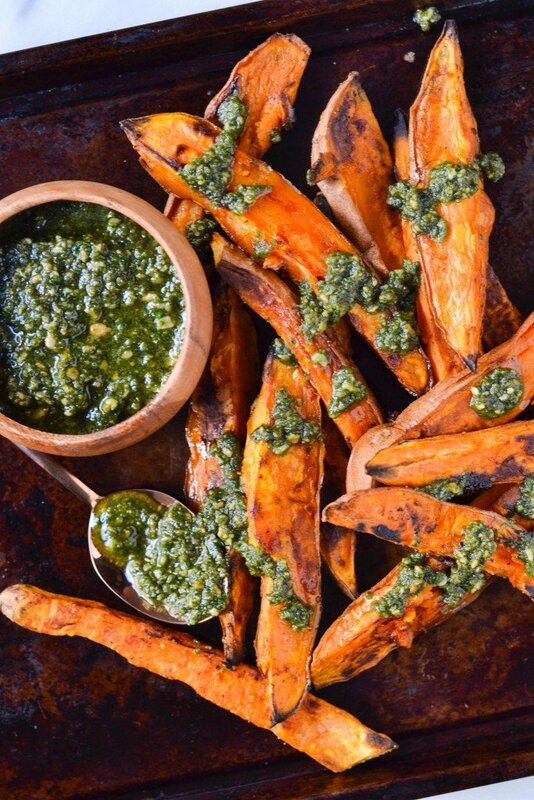 These sweet potato wedges are great as a side with your meal or as a snack while watching television! I mean I know I’ll be eating these wedges while I watch The Bachelor every Monday night. Does anyone else watch that? I’m not ashamed to say we have a bachelor fantasy league going at work and yes, I am in charge of it. You may call me “The Commish” from now on. Hmmm maybe I should change my blog name to “A Dash of the Commish”- maybe in 2017? Anddd we’re back to the sweet potato wedges after that derailment. These potatoes aren’t exactly crispy but they’re perfectly roasted so you get a little bit of a crispy exterior with a soft, tender inside. I love the garlicky parsley pesto that is drizzled on top too! I make a lot of pesto and I always make it with what I have on hand. Today, it was parsley and almonds. But, whatever you have works! Kale and Walnuts.. Basil and Pine Nut.. Cilantro and Pistachio.. the sky is the limit! 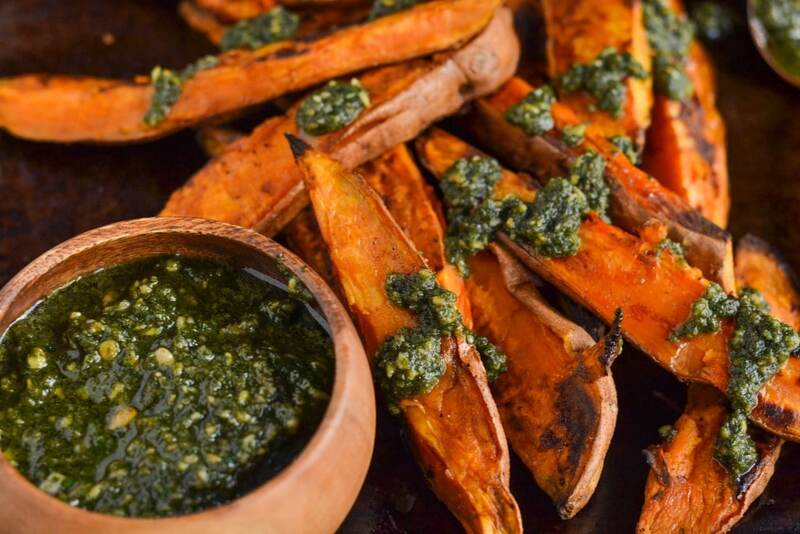 Any way you make it, pesto takes these baked sweet potato wedges to a whole ‘nother level! 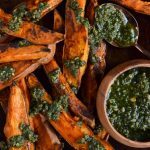 These easy baked sweet potato wedges with vegan parsley pesto are a great side or appetizer to begin your meal! Perfectly crispy with tons of flavor. Gluten-free, dairy-free and vegan. In a bowl, toss together potato wedges, oil, salt, pepper and paprika until completely covered. Place potato wedges on a baking sheet in a single layer. Bake for 25-35 minutes, until potatoes are slightly crispy on the outside and lightly browned. In the meantime, to make the pesto, combe parsley, almonds, garlic, and salt in a food processor and pulse until combined. Then stream in the oil until you reach a thin consistency. 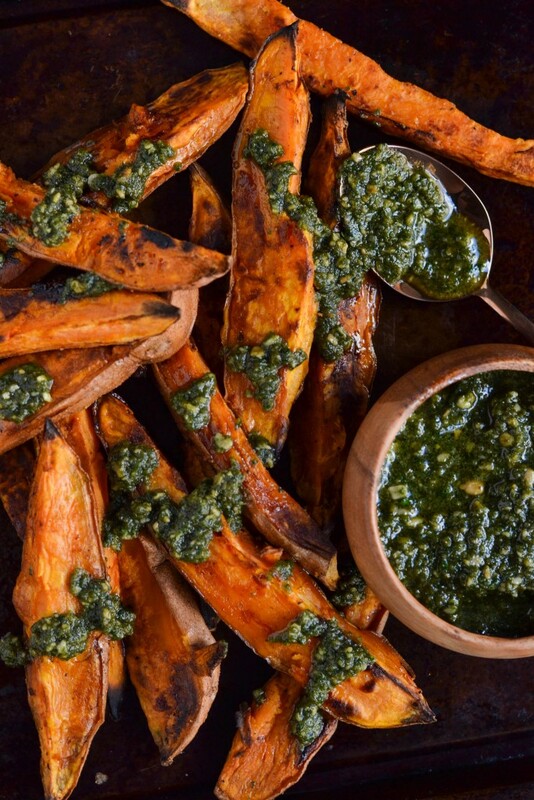 Drizzle the pesto over the potato wedges before serving.